This was an awesome adventure!! Very long!! Two or three snorkel spots that we spent a good 45 minutes at, the slide was so much fun!! The lunch was amazing - even if you’re not a conch fan!! The tour guides were also super fun!! This excursion was well worth the money. The crew was amazing and everyone seemed to have a great time! Would definitely recommend it to others. On March 3rd, we took a chance at this full day excursion. The ocean had been rough all week, but we were ready to swim in the beautiful blues of TCI. This trip turned out to be the highlight of our week in TCI. Our tour guides were Kwee and JJ. Not only were they fun, but very knowledgeable about the islands and so very hospitable. The BBQ lunch was the best on any excursion we had taken from all over the world including Hawaii. Even the kids went for 2nd's on the bbq chicken. We highly recommend this company and the full day cruise. We couldn't imagine doing this on the 1/2 day cruise. You will go to several islands, comb the beaches for great shells, snorkel on 2 reefs and just a great day on the boat. Ask for Kwee and JJ...you won't regret it! pointed out things as we swam...nurse sharks...lobsters. The conch salad was delicious...as was the barbecue. The weather was clear..and the scenery cant be described. Pick up was prompt..and drop off at the beach hotel. We felt it was well worth the money for the full day. We snorkeled at 3 different spots and had a great lunch. 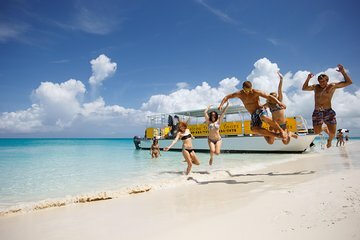 This is the second time I booked a full day cruise, and the first time was great, but the second time we had a bunch of drunks aboard and they made the hold experience just awful. The crew and captain were always helpful and courteous, its just to many apples spoiled the trip. I can understand because most of the resorts people have to pay for drinks, but on the boat everything is included. I don't mind drinking but come on puking over the side of the boat was pretty bad. 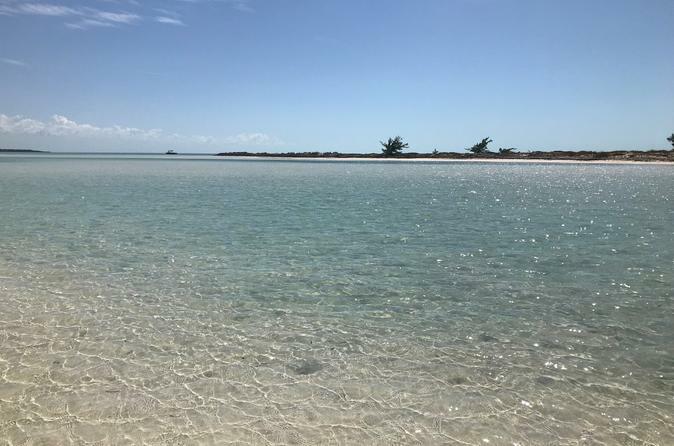 We had a great time on our all-day excursion 3 snorkeling spots including 2 stops at the reef and 1 looking for sand dollars, Iguana Island, lunch on the beach, and a fun time! All of the guys were terrific J.J., loved your dancing! Alex and D.J., great job leading the first snorkel! Totally worth the money, can't recommend it highly enough. Great snorkeling. I enjoyed seeing the iguanas and the BBQ lunch was excellent. I wish there had been a naturalist on board who could have told us more about the sea life we saw and history of the formation of the islands. Even a book of the local fish to identify them would have been handy. Great trip! The guides were funny and informative! The food was fabulous! Freshly grilled and plenty of variety and choices! I would recommend this trip to everyone! I had so much fun. Popz Dean and Girard were the best crew. Everyone had a great time.